There’s a whole world of games sitting in your mobile phone, just waiting to be played. Unfortunately, finding the decent games among the hordes of clones, rip-offs and generally awful titles is a momumental task that would cause most people to break down in tears and swear off gaming for good. Don’t worry, though: you’ve got musicMagpie on your side. We’ve trawled through the rubbish to pick out the finest mobile gaming nuggets from the past month or so. You can thank us later. 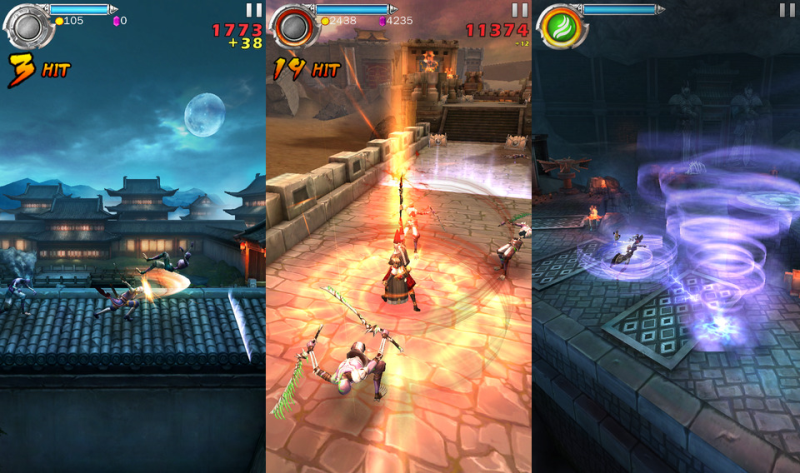 Ghost Blade is a stylish action game inspired by Devil May Cry and Ninja Gaiden. You take control of a ninja who kills hordes of zombies and other beasties with increasingly cool combos. Action games tend to suffer on mobile due to the limitations of touch screen controls (which are more suited to puzzle games than lightning-speed beat-em-ups), but Ghost Blade is surprisingly easy to control. You use a virtual stick to move around, swipe on enemies to hit them and swipe up to jump – it’s that simple. Admittedly, you won’t be launching into 100-hit combos straight away, but the game is very rewarding once you’ve mastered it. It’s also worth noting that Ghost Blade looks incredible; seriously, it’s one of the best looking iOS games we’ve ever seen! Zombie Highway 2 has a simple premise: zombies have taken over the world (again), and you need to drive as far as you can so they can’t munch on your brains. Along the way, various rotting corpses will try and tip your truck over because…well, they’re hungry. Your sole objective is to get the zombies off your truck, and you can do this in a number of ways: scrape them off on obstacles, use a nitrous boost or let your handy co-pilot shoot them with their limited supply of ammo. Zombie Highway 2 is free to play and doesn’t halt your progress with ridiculous objectives and goals either. Of course, you can pay to progress if that’s your idea of a good time too. South Park: Pinball is the latest adaptation in the ever-popular Zen Pinball series (previous adaptations include Marvel, Star Wars and The Walking Dead). The game comes with two tables: one based on South Park in general and other based on the best character in the show, Butters. As you might expect from anything South Park-related, there are loads of crude jokes and references. Some of them even form the basis for missions, such as the mission in which you have to stop Stan being sick when trying to kiss Wendy (which probably sounds quite weird to people who’ve never seen the show…). Flappy Bird clones are ten-a-dozen on both iTunes and the Play Store, although it’s probably worth paying attention when Rovio, the creators of Angry Birds, make one. RETRY sees you guiding a little plane through various maze-like levels, with the added bonus of contending with rain, wind and the occasional rock. Like Flappy Bird, you simply have to tap to keep your plane airborne. As the title suggests, you die a lot in RETRY; it’s quite a frustrating experience, but the lure of trying to conquer the game’s ridiculously difficult levels will soon draw you in for another go. Have you played a decent app game recently? Share it with us in the comments. ← 6 of the scariest videogames ever made. Play them this Halloween!